Ayurveda depicts ‘food’ as god as provides nourishment and energy to the entire living kind. However, with the out-spreading fast food culture and unhealthy eating habits, food is now turning evil for our body and mind. A heart patient or a person with a risk of developing cardiovascular diseases must be very careful while choosing his/her food items. 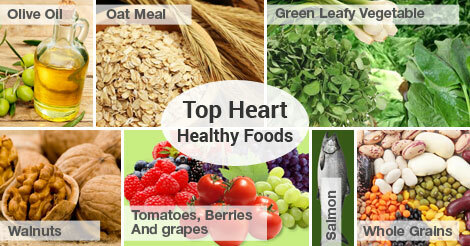 Here is a list of heart healthy food items which can be easily incorporated in an Indian kitchen. Long term studies proved that one serving of green leafy vegetables like spinach, fenugreek, soy, lettuce, green onions, etc. reduces the risk of heart attack by 11%. This activity of these vegetables is attributed to their inherent properties like low fat, low calorie, high in fiber and minerals essential for heart function. Oat meal can act as wonder food for reducing bad cholesterol levels in the body. Beta glucan present in oat meal is a soluble fiber which absorbs the circulating bad cholesterol especially LDL from your blood and removes it from the body. This helps in preventing blood vessel blockade and thus heart attack or other cardiovascular problems. Similar to oatmeal, lentils like chickpeas, pigeon pea, and moong and whole grains like barley, ragi, jowar, and brown rice are high in soluble fiber and thus helps in maintaining blood cholesterol levels. Non-vegetarians with heart problem must refrain from consuming poultry and red meat as they are high in fats and calories. Rather, fish especially ocean fish like salmon must be included in the diet as they contain high amounts of omega-3 fatty acids which helps in preventing clot formation inside blood vessels. Two serving of fish per week can help you to reduce the risk of heart attack and also lower triglyceride levels. Walnuts are rich source of ‘good’ fat. Consuming 5 ounce of walnuts per day helps to maintain LDL/HDL ratio and thus reduces the risk of heart attack by half. It also contains ample amount of omega-3 fatty acids. Tomatoes contain high amount of vitamin K which is necessary for preventing blood clot formation. Berries and grapes contain high amount of anti-oxidant called resveratrol which rejuvenates the heart tissues. Judicial selection of cooking oil is necessary for heart health. All these oils are good for heart as they are low in trans-fats and high in monounsaturated fat contents. This property helps to maintain good cholesterol level in the body. Also, rice bran oil contains Oryzanol which is highly effective in reduces LDL levels.